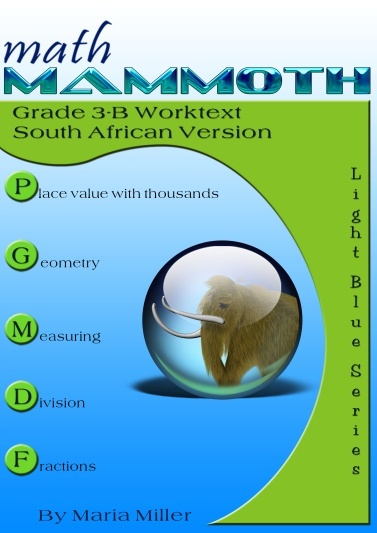 Math Mammoth Grade 3, South African Version is a complete maths program for 3rd grade. It consists of two student worktexts (A and B), a separate answer key for each worktext, tests, mixed revisions, and in the download version, an additional worksheet maker (Internet access required) to make extra practice worksheets when needed. Students develop an understanding of multiplication and division of whole numbers through problems involving equal-sized groups, arrays, and area models. They learn the relationship between multiplication and division, and solve many word problems involving multiplication and division (chapters 2, 3, and 9). Students develop an understanding of fractions, beginning with unit fractions. They use visual fraction models and study fractions on a number line. Students also compare fractions by using visual fraction models and strategies based on noticing equal numerators or denominators (chapter 10). Students learn the concepts of area and perimeter. They relate area to multiplication and to addition, recognise perimeter as a linear measure (in contrast with area), and solve problems involving area and perimeter (chapter 7). Additional topics we study are time (chapter 4), money (chapter 5), measuring (chapter 8), and bar graphs and picture graphs (in various chapters). Please note that the curriculum is not following the South African official syllabus for 3rd grade maths. Instead, it simply is a copy of the US version of Math Mammoth Grade 3. For the most part, Math Mammoth exceeds South African standards. Some standards may not be covered. A non-digital clock or other analog clock where you can turn the minute hand and the hour hand will turn accordingly (optional; for 3-A).